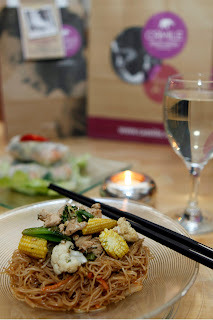 Even though the nearest branch is many miles away, I've always hungered for a takeaway from Camile Thai Kitchen, which offers authentic Thai food for take home and delivery. They've now teamed up with Michelin-starred chef Kevin Thornton to offer a new dish for a limited time only: Mae Chan Chicken. 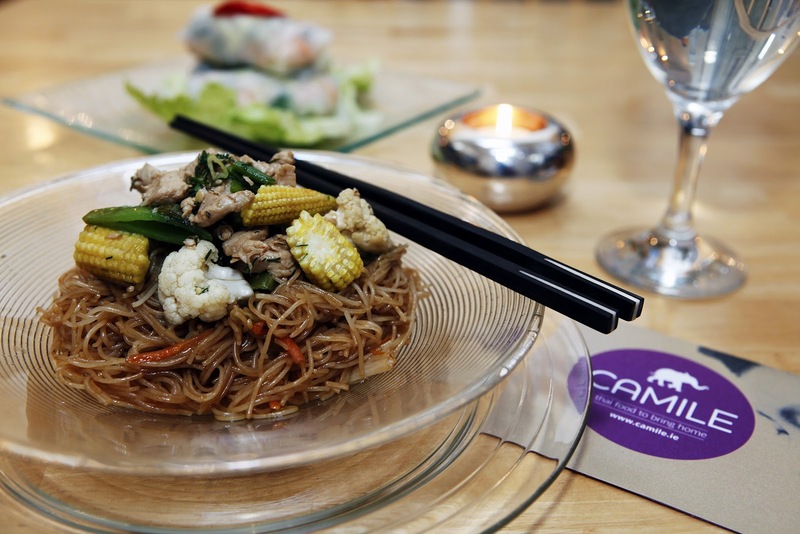 Camile Thai Kitchen aims to provide tasty, healthy authentic Thai food, prepared to a restaurant standard, to be enjoyed in your own home. Kevin’s Mae Chan Chicken, served with stir-fried noodles, at €12.95, is a perfect fit. The Mae Chan chicken was inspired by the street food he relished in that northern Thailand district, which is known for the beauty of its scenery and tranquility. Corn fed chicken breasts are cut into strips to marinade in a complex 12 ingredient mix, before being stir-fried with a separately prepared sauce, topped with briefly blanched crisp vegetables and herbs to be enjoyed with stir-fried noodles, packaged separately. Among the flavours that shine through are lemongrass, ginger, chilli and citrus from the marinade, complemented by the citrus zest, chives and dill fresh herb mix topping. The last minute preparation ensures perfectly cooked chicken, crunchy vegetables and fragrant herbs, atop perfectly firm, seasoned noodles. A perfect first course would be Camile’s signature starter, Po Pia Sot, Thai rice paper rolls with fresh steamed Irish salmon, baby leaves, fresh mint, beansprouts, pickled ginger and a tiny hint of wasabi mayonnaise – served cold with sweet chilli dip at €5.50. I got to try both the Po Pia Sot and the Mae Chan Chicken last Friday night on my way home. I can assure you that it reheats perfectly after a 60km car journey and those white paper cartons may look small but they were packed full of the most fragrant and aromatic chicken and noodles. The Hubs is not a fish lover but we squabbled over the last of the Po Pia Sot which were light and luscious. By the way they're not my photos, we ate too fast to be polite and take snaps of the food! Online ordering is available via Camile's website, or by phone directly to one of the four branches in Dun Laoghaire, Rathmines, Phibsborough and South Circular Road. 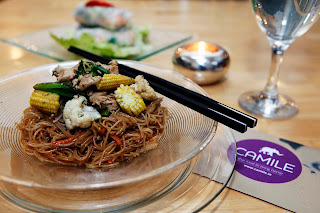 I was a guest of Camile Thai Kitchen. It's always a good idea to add new items to the menu. That's one way everything from a caterer sydney to a luxury 5-star restaurant can keep things interesting for their diners. Oh, noodles! For my wedding, I'd definitely add this to the menu. I would like it to symbolize long and lovely years between me and my wife. new kitchen sydney is more than simply a place to prepare meals; it is the essence of your home and an investment in your lifestyle. Whether you are looking to create a bold and punchy contrast or an understated look to coordinate with your surroundings, our team at Kitchen Essence ensure that the result reflects the character of the owner and the home. Very good, true to what I was looking for. Thank you.